When I saw this weapon being practiced in the training hall for the first time I was seriously intrigued, and a little scared. For me it is a fascinating thing that really represents the more esoteric and unique side of Chinese martial arts. Digging deeper into its history has been a challenge that is far from over. As you can see in the photo above one significant step forward I have made in creating a more complete and historically accurate understanding of this weapon is to find an authentic nineteenth or early twentieth century example. This weapon above is actually one of many antique whip chains that I own and plan to share on this site over time. I also collect photos, specifications, and or related history if possible of other old examples to compare and contrast. These antiques are a great window into the history of this weapon in the later Qing and Republican eras, as well as historic bench marks for us to judge its evolution over time into what we practice with today. The example from my collection above is a great piece that I feel is relatively representative of many antique whip chains I have handled. First and foremost it is big and heavy. This is a weapon you would not want to be on the receiving end of. Like many of the other weapons we have explored so far you can see the geometric formed pommel and guard design that is a hallmark of many nineteenth century Chinese hand held weapons. The first ring attaches to the top of this grip section in a stationary metal loop that is integral to the handle and does not move. 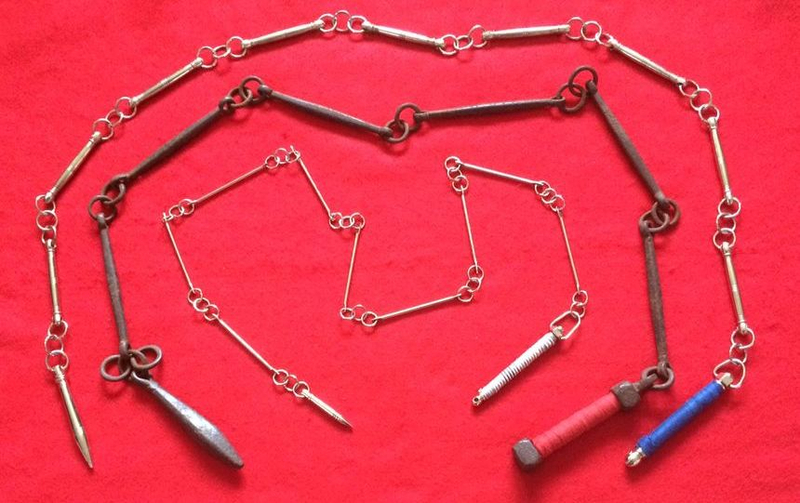 This is certainly different from the modern made whip chains we train with today. These have a section on top of the grip that swivels. This type of mechanism can also be seen in antique examples as well but the fixed connection type is the most common that I have seen in the historic material record. Moving up the piece to the rings you can see some irregularities in their construction. They are far from perfect copies of each other and look smith made. Again like many of the other weapons on this site you can see the rings and the rest of the piece is a product of forge welding where super-heated metal is hammer shaped or joined into specific designs. No seam can be seen on these rings. It is also interesting to note how much wear is present on certain parts of them where they rubbed excessively. This particular piece looks like it was used often. The long sectional pieces are really well executed. They are essentially squared down their length with subtly rounded edges. The ends that receive the rings were hammered long and rolled over leaving space for the connecting ring, then forge welded back into the main section on the other side. Some very minor evidence of a seam that has probably broken down over time can be seen on a couple sections. For as well done as they are, you can also see that each section and ring for that matter is slightly different in some way as is the nature of a hand made piece. Moving to the large percussive end, you see it attached by a slightly larger ring than any other on the chain. There are also two other rings attached to this link. Sometimes you see this multi ring design on old examples and sometimes you do not. Like so many other Chinese weapons, variety seems to be the rule rather than the exception. Even the number of sections seems to vary from piece to piece without a consistent norm. 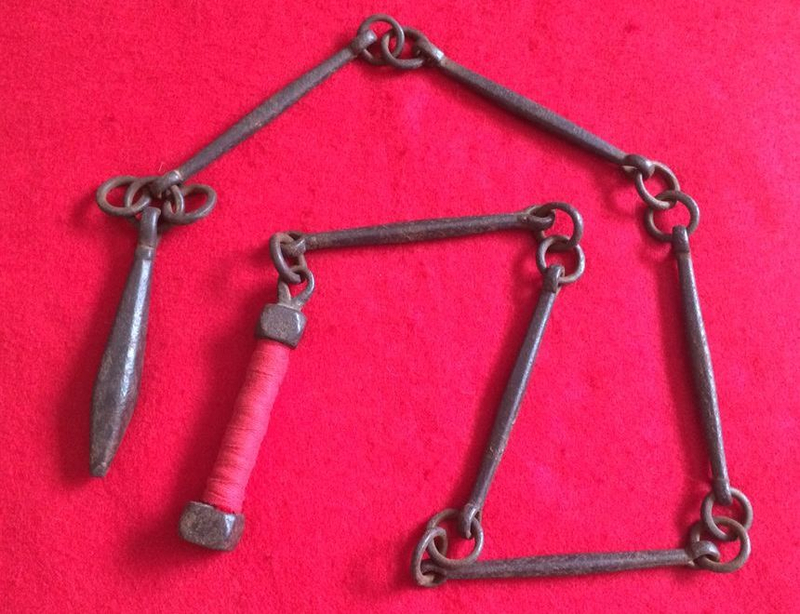 Today we generally see whip chains for sale in either seven or nine sections, but I have seen antique ones in 3, 4, 5, 6, 7, 8 and 9. Again, over and over I see great diversity in these old weapons that deviates from our perceived norms as modern martial artists. Another interesting aspect that has become apparent is the surprising numbers of old whip chains that I have seen over the years. When I first started my study of antique Chinese weapons I really thought this was a particularly rare and obscure type of weapon that survived into our modern martial art systems. Of course relatively speaking all these old antique weapons are rare, but some more than others. Still, I have seen numbers come out of Northern China and particularly Shandong provinces that lead me to believe it was more prevalent than I had originally thought. I think I was wrong about its popularity in civilian martial art use. Continued research is obviously still needed. With that said, old photographs are another important tool for researching history. I felt very fortunate to find this rare image below. A few words on the history of photography in China might be in order before discussing this great photo below. Photography was introduced by westerners in China during the mid-nineteenth century, moving from port cities inland throughout the following decades. By the turn of the century most major cities had western or Chinese photographers and studios. Both portrait and street life were common subjects. The book “Brush and Shutter – Early Chinese Photography” 2011 is a great resource to learn more on the subject. What a fascinating photograph. Unfortunately I do not know a lot of the specifics on this one such as who took it or exactly when. I can tell you definitively though that these types of photos are quite rare. 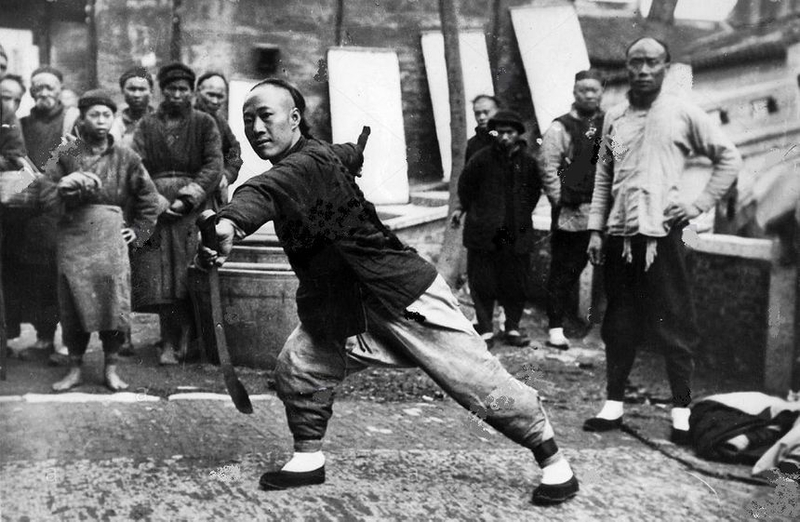 Capturing images of later nineteenth or early twentieth century civilian martial artists in action are hidden treasures. Despite the fact there we only have the image to study; from it we can glean some fair assumptions. Because the men are wearing their hair in a queue cut I believe it was taken before 1911. After the fall of the Qing dynasty in this year that hair style was no longer in general favor. The scene as a whole looks like a street performance. Clearly everyone has gathered around the swordsman. Most importantly for our purposes now is the object laying on the ground in the bottom right corner of the frame. I believe this is the weapon of the second performer sitting at his feet. This is the first historic photo of a whip chain and its owner that I have ever seen, very exciting. I do not think it was a coincidence either that both of these two martial artists are demonstrating two of the flashiest and most impressive weapons, the double saber and whip chain. I would love to have more information related to the context of this scene. Was seeing this type of display part of normal street life in the city? Was this a means for these men to make money by demonstrating their skills like modern street performers? Maybe it was an advertisement for their services as bodyguards. Actually seeing real life photos like these certainly stirs up more questions for further thought and research. Just putting a face to some of these old weapons is valuable to me and roots them in actual history. More research and most importantly actual evidence to create a clearer picture of civilian Chinese martial arts of the late Qing and Republic eras is needed. Most styles pass down some measure of oral history that can be one of the building blocks to a more complete understanding of how these martial arts were seen, lived, and passed on in Chinese culture. Its seems to me though that using period texts, photos, weapons etc. have been underutilized and we are still left with a fragmented and incomplete picture of the past and its evolution into the present. I cringe when I hear the stuff of legend being passed off as actual history. I think if we in the modern martial art community want to preserve and potentially enhance what remains of this tradition we need to take real history more seriously. Thankfully I think there is a growing appreciation and desire for just that today. 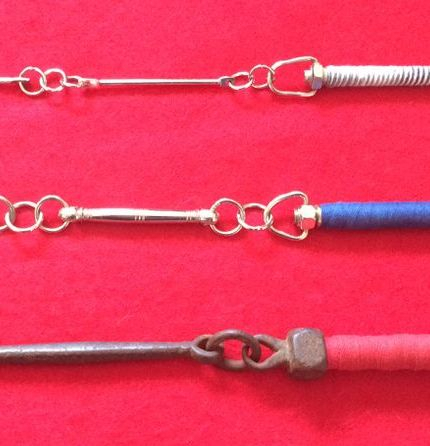 The photos below are a great opportunity to how whip chains have changed over time. Please click on the image to see entire photo. Clearly the weight and size has decreased relative to modern reproduction and use. It appears that a shift away from using it as an actual weapon has had quite an effect. It is a trend that can be seen in almost all modern Chinese martial art practice weapons today. Training tools that are geared more for ease of use and enhanced demonstration potential are the majority of what’s available. I am hoping that seeing antique examples on this site will at very least expose and hopefully educate today's kung fu practitioners on what actual historic Chinese combat weapons were. With a more complete picture of our Chinese martial arts in the past and present every practitioner can choose for themselves on how to guide their training. Time inevitably changes things as we can see in the comparisons above, but we in the present definitely have opportunities to guide it moving forward. 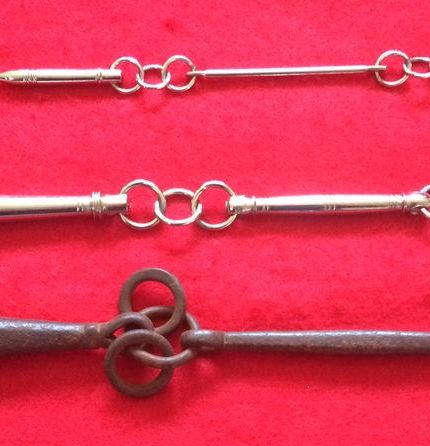 For more thought provoking opportunities please visit the photo gallery section to see additional antique whip chain examples to compare and contrast.